There are 27 publications for Financial regulation. Many of the hopes arising from the 1989 fall of the Berlin Wall were still unrealized in 2010 and remain so today, especially in monetary policy and financial supervision. The major players that helped bring on the 2008 financial crisis still exist, with rising levels of moral hazard, including Fannie Mae, Freddie Mac, the too-big-to-fail banks, and even AIG. In monetary policy, the Federal Reserve has only just begun to reduce its vastly increased balance sheet, while the European Central Bank has yet to begin. The Dodd-Frank Act of 2010 imposed new conditions on but did not contract the greatly expanded federal safety net and failed to reduce the substantial increase in moral hazard. The larger budget deficits since 2008 were simply decisions to spend at higher levels instead of rational responses to the crisis. Only an increased reliance on market discipline in financial services, avoidance of Federal Reserve market interventions to rescue financial players while doing little or nothing for households and firms, and elimination of the Treasury’s backdoor borrowings that conceal the real costs of increasing budget deficits can enable the American public to achieve the meaningful improvements in living standards that were reasonably expected when the Berlin Wall fell. A Reinterpretation of Henry Simons’s “Rules versus Authorities in Monetary Policy"
Henry Simons’s 1936 article “Rules versus Authorities in Monetary Policy” is a classical reference in the literature on central bank independence and rule-based policy. A closer reading of the article reveals a more nuanced policy prescription, with significant emphasis on the need to control short-term borrowing; bank credit is seen as highly unstable, and price level controls, in Simons’s view, are not be possible without limiting banks’ ability to create money by extending loans. These elements of Simons’s theory of money form the basis for Hyman P. Minsky’s financial instability hypothesis. This should not come as a surprise, as Simons was Minsky’s teacher at the University of Chicago in the late 1930s. I review the similarities between their theories of financial instability and the relevance of their work for the current discussion of macroprudential tools and the conduct of monetary policy. According to Minsky and Simons, control of finance is a prerequisite for successful monetary policy and economic stabilization. Government forbearance, support, and bailouts of banks and other financial institutions deemed “too big to fail” (TBTF) are widely recognized as encouraging large companies to take excessive risk, placing smaller ones at a competitive disadvantage and influencing banks in general to grow inefficiently to a “protected” size and complexity. During periods of financial stress, with bailouts under way, government officials have promised “never again.” During periods of financial stability and economic growth, they have sanctioned large-bank growth by merger and ignored the ongoing competitive imbalance. Repeated efforts to do away with TBTF practices over the last several decades have been unsuccessful. Congress has typically found the underlying problem to be inadequate regulation and/or supervision that has permitted important financial companies to undertake excessive risk. It has responded by strengthening regulation and supervision. Others have located the underlying problem in inadequate regulators, suggesting the need for modifying the incentives that motivate their behavior. A third explanation is that TBTF practices reflect the government’s perception that large financial firms serve a public interest—they constitute a “national resource” to be preserved. In this case, a structural solution would be necessary. Breakups of the largest financial firms would distribute the “public interest” among a larger group than the handful that currently hold a disproportionate concentration of financial resources. The Dodd-Frank Wall Street Reform and Consumer Protection Act of 2010 constitutes the most recent effort to eliminate TBTF practices. Its principal focus is on the extension and augmentation of regulation and supervision, which it envisions as preventing excessive risk taking by large financial companies; Congress has again found the cause for TBTF practices in the inadequacy of regulation and supervision. There is no indication that Congress has given any credence to the contention that regulatory motivations have been at fault. Finally, Dodd-Frank eschews a structural solution, leaving the largest financial companies intact and bank regulatory agencies still with extensive discretion in passing on large bank mergers. As a result, the elimination of TBTF will remain problematic for years to come. Over the past 40 years, regulatory reforms have been undertaken on the assumption that markets are efficient and self-corrective, crises are random events that are unpreventable, the purpose of an economic system is to grow, and economic growth necessarily improves well-being. This narrow framework of discussion has important implications for what is expected from financial regulation, and for its implementation. Indeed, the goal becomes developing a regulatory structure that minimizes the impact on economic growth while also providing high-enough buffers against shocks. In addition, given the overarching importance of economic growth, economic variables like profits, net worth, and low default rates have been core indicators of the financial health of banking institutions. This paper argues that the framework within which financial reforms have been discussed is not appropriate to promoting financial stability. Improving capital and liquidity buffers will not advance economic stability, and measures of profitability and delinquency are of limited use to detect problems early. The paper lays out an alternative regulatory framework and proposes a fundamental shift in the way financial regulation is performed, similar to what occurred after the Great Depression. It is argued that crises are not random, and that their magnitude can be greatly limited by specific pro-active policies. These policies would focus on understanding what Ponzi finance is, making a difference between collateral-based and income-based Ponzi finance, detecting Ponzi finance, managing financial innovations, decreasing competitions in the banking industry, ending too-big-to-fail, and deemphasizing economic growth as the overarching goal of an economic system. This fundamental change in regulatory and supervisory practices would lead to very different ways in which to check the health of our financial institutions while promoting a more sustainable economic system from both a financial and a socio-ecological point of view. Regulatory forbearance and government financial support for the largest US financial companies during the crisis of 2007–09 highlighted a "too big to fail" problem that has existed for decades. As in the past, effects on competition and moral hazard were seen as outweighed by the threat of failures that would undermine the financial system and the economy. As in the past, current legislative reforms promise to prevent a reoccurrence. This paper proceeds on the view that a better understanding of why too-big-to-fail policies have persisted will provide a stronger basis for developing effective reforms. After a review of experience in the United States over the last 40 years, it considers a number of possible motives. 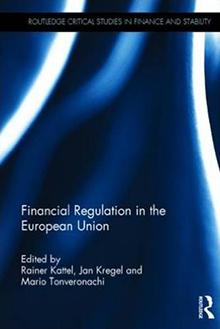 The explicit rationale of regulatory authorities has been to stem a systemic threat to the financial system and the economy resulting from interconnections and contagion, and/or to assure the continuation of financial services in particular localities or regions. It has been contended, however, that such threats have been exaggerated, and that forbearance and bailouts have been motivated by the "career interests" of regulators. Finally, it has been suggested that existing large financial firms are preserved because they serve a public interest independent of the systemic threat of failure they pose—they constitute a "national resource." Each of these motives indicates a different type of reform necessary to contain too-big-to-fail policies. They are not, however, mutually exclusive, and may all be operative simultaneously. Concerns about the stability of the financial system dominate current legislative proposals; these would strengthen supervision and regulation. Other kinds of reform, including limits on regulatory discretion, would be needed to contain "career interest" motivations. If, however, existing financial companies are viewed as serving a unique public purpose, then improved supervision and regulation would not effectively preclude bailouts should a large financial company be on the brink of failure. Nor would limits on discretion be binding. To address this motivation, a structural solution is necessary. Breakups through divestiture, perhaps encompassing specific lines of activity, would distribute the "public interest" among a larger group of companies than the handful that currently hold a disproportionate and growing concentration of financial resources. The result would be that no one company, or even a few, would appear to be irreplaceable. Neither economies of scale nor scope appear to offset the advantages of size reduction for the largest financial companies. At a minimum, bank merger policy that has, over the last several decades, facilitated their growth should be reformed so as to contain their continued absolute and relative growth. An appendix to the paper provides a review of bank merger policy and proposals for revision. The extension of the subprime mortgage crisis to a global financial meltdown led to calls for fundamental reregulation of the United States financial system. However, that reregulation has been slow in implementation and the proposals under discussion are far from fundamental. One explanation for this delay is the fact that many of the difficulties stemmed not from lack of regulation but from a failure to fully implement existing regulations. At the same time, the crisis evolved in stages, interspersed by what appeared to be the system’s return to normalcy. This evolution can be defined in terms of three stages (regulation and supervision, securitization, and a run on investment banks), each stage associated with a particular failure of regulatory supervision. It thus became possible to argue at each stage that all that was necessary was the appropriate application of existing regulations, and that nothing more needed to be done. This scenario progressed until the collapse of Lehman Brothers brought about a full-scale recession and attention turned to support of the real economy and employment, leaving the need for fundamental financial regulation in the background. This four-part study is a critical analysis of several reports dealing with the reform of the financial system in the United States. The study uses Minsky’s framework of analysis and focuses on the implications of Ponzi finance for regulatory and supervisory policies. The main conclusion of the study is that, while all reports make some valuable suggestions, they fail to deal with the socioeconomic dynamics that emerge during long periods of economic stability. As a consequence, it is highly doubtful that the principal suggestions contained in the reports will provide any applicable means to limit the worsening of financial fragility over periods of economic stability. The study also concludes that any meaningful systemic and prudential regulatory changes should focus on the analysis of expected and actual cash flows (sources and stability) rather than capital equity, and on preventing the emergence of Ponzi processes. The latter tend to emerge over long periods of economic stability and are not necessarily engineered by crooks. On the contrary, the pursuit of economic growth may involve the extensive use of Ponzi financial processes in legal economic activities. The study argues that some Ponzi processes—more precisely, pyramid Ponzi processes—should not be allowed to proceed, no matter how severe the immediate impact on economic growth, standards of living, or competitiveness. This is so because pyramid Ponzi processes always collapse, regardless how efficient financial markets are, how well informed and well behaved individuals are, or whether there is a “bubble” or not. The longer the process is allowed to proceed, the more destructive it becomes. Pyramid Ponzi processes cannot be risk-managed or buffered against; if economic growth is to be based on a solid financial foundation, these processes cannot be allowed to continue. Finally, a supervisory and regulatory process focused on detecting Ponzi processes would be much more flexible and adaptive, since it would not be preoccupied with either functional or product limits, or with arbitrary ratios of “prudence.” Rather, it would oversee all financial institutions and all products, no matter how new or marginal they might be. See also, Working Paper Nos. 574.1, 574.2, and 574.3. See also, Working Paper Nos. 574.1, 574.2, and 574.4. See also, Working Paper Nos. 574.1, 574.3, and 574.4. See also, Working Paper Nos. 574.2, 574.3, and 574.4. This study analyzes the trends in the financial sector over the past 30 years, and argues that unsupervised financial innovations and lenient government regulation are at the root of the current financial crisis and recession. Combined with a long period of economic expansion during which default rates were stable and low, deregulation and unsupervised financial innovations generated incentives to make risky financial decisions. Those decisions were taken because it was the only way for financial institutions to maintain market share and profitability. Thus, rather than putting the blame on individuals, this paper places it on an economic setup that requires the growing use of Ponzi processes during enduring economic expansion, and on a regulatory system that is unwilling to recognize (on the contrary, it contributes to) the intrinsic instability of market mechanisms. Subprime lending, greed, and speculation are merely aspects of the larger mechanisms at work. It is argued that we need to change the way we approach the regulation of financial institutions and look at what has been done in other sectors of the economy, where regulation and supervision are proactive and carefully implemented in order to guarantee the safety of society. The criterion for regulation and supervision should be neither Wall Street’s nor Main Street’s interests but rather the interests of the socioeconomic system. The latter requires financial stability if it’s to raise, durably, the standard of living of both Wall Street and Main Street. Systemic stability, not profits or homeownership, should be the paramount criterion for financial regulation, since systemic stability is required to maintain the profitability—and ultimately, the existence—of any capitalist economic entity. The role of the government is to continually counter the Ponzi tendencies of market mechanisms, even if they are (temporarily) improving standards of living, and to encourage economic agents to develop safe and reliable financial practices. Third Time a Charm? Or Strike Three? United States financial regulation has traditionally made functional and institutional regulation roughly equivalent. However, the gradual shift away from Glass-Steagall and the introduction of the Financial Modernization Act (FMA) generated a disorderly mix of functions and products across institutions, creating regulatory gaps that contributed to the recent crisis. An analysis of this history suggests that a return to regulation by function or product would strengthen regulation. The FMA also made a choice in favor of financial holding companies over universal banks, but without recognizing that both types of structure require specific regulatory regimes. The paper reviews the specific regime that has been used by Germany in regulating its universal banks and suggests that a similar regime adapted to holding companies should be developed.